The Ripley Wolves took a 2-0 series lead in the WOAA Senior ‘A’ semi-final against Shelburne. The Wolves scored a late goal on Friday night to win 3-2 and added an empty netter to win 7-5 on Saturday night on the road. On Friday night, Kurt Edwards got the start in the Wolves net as they opened their semi-final on home ice. The Wolves opened the scoring early in the second when Tyson Soers scored from Brett Catto and Drew Davidson. The Muskies tied it up with a powerplay goal late in the period. The visitors took a 2-1 lead with 7 minutes remaining, again on the powerplay, but Catto scored a shorthanded goal three minutes later to tie the game, with Davidson getting the assist. Catto then sealed the victory with 50 seconds left on the clock, from Corey McCrae. Edwards made 29 saves in the win. On Saturday night, Jamie Bailey was between the pipes for the Wolves in what was a far more open game on the scoresheet for both teams. It was 2-1 Shelburne after the first period, 4-4 after the second and a 7-5 final with an empty netter. Wolves goals were scored by McCrae, Davidson (2), Catto (another shorthanded goal), Jarred Colling, Soers and Ryan Armstrong. Assists went to Tim Dwinnell (2), Alex MacLeod, Jeremy McQuillin (2), Davidson (2), McCrae, Soers, Brian Stanley and Catto (2). Bailey stopped 29 shots in the win. The Wolves will host Game 3 on Friday night at 8:30 p.m. and could possibly wrap up the series on Saturday night in Shelburne at 8 p.m. The Ripley Wolves will face the Shelburne Muskies in a best-of-seven ‘A’ semi-final beginning Friday night in Ripley. The Wolves made their way into the semi-finals with a 3-0 win in Lucknow on Saturday night, also play the Muskies in a meaningless game on Tuesday night on the road. Puck drop in Ripley is at 8:30 p.m. on Friday. The rest of the series has yet to be determined. The Ripley Wolves likely secured themselves a spot in the WOAA Senior ‘A’ semi-finals with a 3-0 win in Lucknow on Saturday night. The Wolves, 0-2 in round-robin play after a 6-5 loss to Milverton on Friday night, got two early goals from Drew Davidson and hung on to shut out their cross-township rivals on Saturday night. Davidson added an empty netter to complete the hat trick. The Wolves will wrap up the round-robin on Tuesday night at 9:30 in Shelburne. The semi-finals will begin next weekend. Watch ripleywolves.com, Twitter and Facebook for game information. Mother Nature interfered with the Ripley Wolves round-robin playoffs this past weekend, cancelling Friday night at home vs Milverton and Saturday’s game in Shelburne. Milverton will now travel to Ripley on Friday, Feb. 19, at 8:30 p.m. Ripley plays in Lucknow on Saturday night at 7:30 p.m. The Wolves will wrap up their round-robin playoffs with a trip to Shelburne, though the rescheduled date is still to be determined. 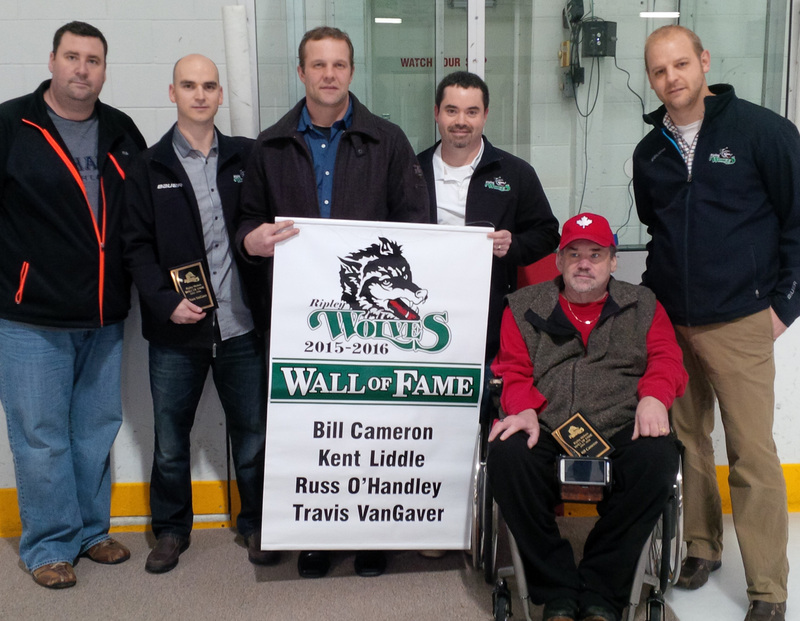 Kevin Taylor, left, President of the Ripley Wolves executive, and Mark Smith, right, Wolves head coach, honoured new Wall of Fame members Travis VanGaver, Russ O’Handley, Kent Liddle and Bill Cameron on Friday night. The Ripley Wolves and Tillsonburg Thunder had never faced each other in a game – regular season or otherwise – until Friday night’s opening round-robin game of the Senior ‘A’ playoffs. It didn’t take long for the teams to become acquainted, and we can only hope these two teams face each other in a seven-game final in six weeks. Tillsonburg won the wildly entertaining game 5-4 in overtime, after the teams traded chance after chance in the third period and extra frame, the game ready to break in someone’s favour but unable to do so. The game had speed, skill, odd bounces, posts, hard hits and two fights on the same stoppage of play in the second period that seemingly came out of nowhere. It was a lot of fun for fans, and we can only hope the rest of the round-robin and Senior ‘A’ playoffs maintains this pace. The Wolves came out of the first tied at 1-1 after the teams traded powerplay goals. Ryan Dudgeon sniped for the Wolves, assisted by Tyler McCarthy and Dylan Sayle. The Thunder jumped out to an early lead in the second period, but Ripley again responded quickly with a Drew Davidson goal, assisted by Brett Catto and Brian Stanley. Before the second was out, Tillsonburg scored a shorthanded goal but the resilient Wolves tied it up once again. This time it was Tim Dwinnell who scored. Dwinnell then gave the Wolves the lead early in the third, with assists to Stanley and Dustin Catto – who took a scary shot to the cheek early in the game but powered through to take many important defensive-zone faceoffs – but they couldn’t hold onto the late lead and the Thunder tied it with less than four minutes to go. Mitch Campbell faced 41 shots in the Wolves net and came up huge until a seeing-eye slapshot from the point beat the screened netminder in OT. Ripley will host Milverton at 9 p.m. on Friday, Feb. 12, as part of Ripley’s Winter Carnival event. They then travel to Shelburne on Saturday for an 8 p.m. puck drop. They complete the round-robin schedule in Lucknow on Saturday, Feb. 20, at 7:30 p.m. The top four teams from the round-robin move to the Senior ‘A’ semi-finals to begin their best-of-seven series. The Ripley Wolves will face the Lucknow Lancers, Tillsonburg Thunder, Milverton 4-Wheel Drives and the Shelburne Muskies in a four-game round-robin to determine the teams that will vie for the Senior ‘A’ title. Ripley will host Tillsonburg on Friday, Feb. 5, at 8:30 p.m. Before the game, Bill Cameron, Russ O’Handley, Kent Liddle and Travis VanGaver will be added to the Wolves Wall of Fame. Once the round-robin is complete, the top four teams will face off in best-of-seven semi-finals, with the winners facing each other in the final. Ripley is the defending Senior A champion, having defeated Shallow Lake in a thrilling seven-game series last year. Friday, Feb. 12 – Milverton at Ripley, 9 p.m.
Saturday, Feb. 13 – Ripley at Shelburne, 8 p.m.
Saturday, Feb. 20 – Ripley at Lucknow, 7:30 p.m.